Chef Charles Mattocks Creates the "Charles Bar"
Celebrity chef Charles Mattocks, aka the "Poor Chef", is proud to introduce his newest creation, the Charles Bar. The Charles Bar is unique in that it offers chocolate lovers a premium Belgian chocolate indulgence that’s sugar free, gluten free, low in net carbs and guaranteed to be some of the best chocolate you’ve ever tasted, bar none. A diabetic himself, it was important for Charles to find a premium quality chocolate that was diabetic friendly and yet possessed all the desirable attributes of fine chocolate– rich robust flavor, creamy texture, pleasing mouth feel and no unpleasant aftertaste. After sampling many of the sugar free chocolate products widely available in stores and finding none that measured up to his standard, he didn’t know if it would be possible. Then one day he remembered eating a really good sugar free Belgian chocolate bar while living in California. With a little effort, he found the company that made the sugar free chocolate he remembered– Amber Lyn. 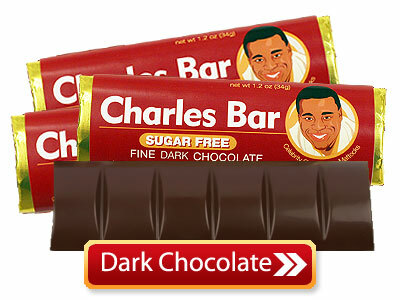 Charles approached the Southern Utah company well known for its premium sugar free and no sugar added chocolate confections. It was to be a match made in sugar free heaven. Working together, the chocolatiers at Amber Lyn and Charles created a blend of imported Belgian chocolate with healthy natural ingredients including coconut oil, and a unique melt-in-your-mouth truffle like texture. The new bar met all of Charles’ demanding requirements. In Charles’ words, "There isn’t anything else quite like the Charles Bar. People looking for great tasting healthier chocolate, including diabetics, are going to be totally blown away. It’s that good. It’s better than good, it’s great." The Coconut oil in the Charles Bar contains lauric acid, capric acid and caprylic acid. These possess properties that are antimicrobial, antioxidant, antifungal, antibacterial and soothing. Coconut oil has been found useful in stress relief, maintaining cholesterol levels, weight loss, increased immunity, proper digestion and metabolism, diabetes, heart diseases, high blood pressure, and bone strength. 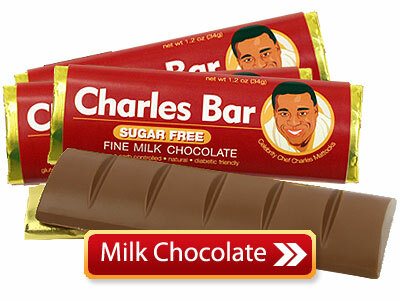 The Charles Bar comes in two varieties, No Sugar Added Milk Chocolate and Sugar Free Dark Chocolate.